The photographs of the climbs are stunning and awe inspiring. It makes you want to go out and ride them. There is a good history of the climbs and the important moments in professional cycling. Reading the book brought back memories of previous Tour de France editions, long buried in my memory. For example, I remember all those years ago watching Bjane Riis make that spectacular acceleration to drop five times winner Miguel Indurain. I now know that famous (or infamous) acceleration was at Hautacam in the Pyranees, close to the city of Lourdes. It was probably one of the first Tour de Frances I watched; in those days I was totally unaware of all the sub-plots going on underneath – like how did a 32 year old domestique (Bjarne Riis) suddenly re-invent himself as a grand tour contender? The stats are very good. 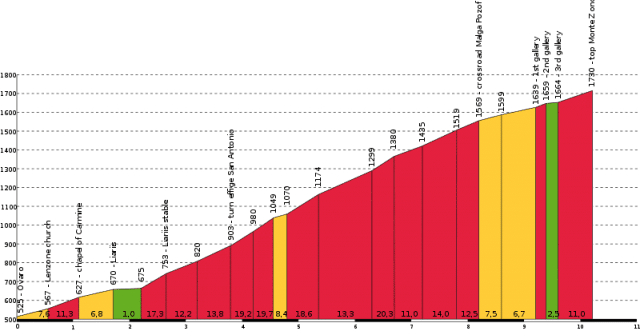 Showing gradients for each kilometer and also the different ascents that you can make for each climb. For anyone travelling around Europe wanting to have a go at climbing the major climbs of European cycling, this book makes an excellent companion. It is also excellent for anyone following the Tour de France / Giro / Vuelta on tv. You can be reading about the climbs as you watch the riders go up. There is an interesting quote that the Tour de France is not just about the legendary riders. The climbs can be as iconic, if not more so than the riders. Photo Mikel Ortega – Flickr. Recently, I reviewed 100 Climbs of the Tour de France. An excellent overview for the top 100 climbs used in the Tour de France. That book whetted my appetite to find more history behind the climbs. Mountain High does this very well. As an economist one of my favourite random nuggets of info was about the 759 metre climb of Col du Pin Bouchain near Roanne, which was the first major climb used in the Tour de France (1903). Until the arrival of the Tour de France it’s chief claim to fame was a visit by Napoleon. When Napoleon wishing to buy some eggs, Napoleon was shocked at the price of eggs. “Are eggs so rare in this region that they justify such a bill?’ The owner of the hostelry replied. “It’s not the eggs that are rare, it’s Emperors.” – I even used this incident in my economics blog as an example of a monopoly seller capturing the consumer surplus of an Emperor – all because it happened on the first mountain used in the Tour de France. The point is there are lots of interesting and varied anecdotes about the climbs, which help them give a strong history. One of the hardest things with writing a book associated with procycling is – how do you deal with the legacy of doping? Even writing about mountains, you can’t help but notice the great ‘heroes’ of the mountains are invariably riders with a very chequered doping history. But, it is dealt with fairly. There’s no avoiding of the fact many winners were later known to be dopers, but it avoids making doping the primary issue – showing the mountains are still the stars of the show, no matter how many indiscretions of the riders. Cyclinguphill doesn’t usually go in for product ratings, but I would rate Mountain High 10/10. The only problem is that these mountains do make Snake Pass and the like, look rather feeble in comparison. 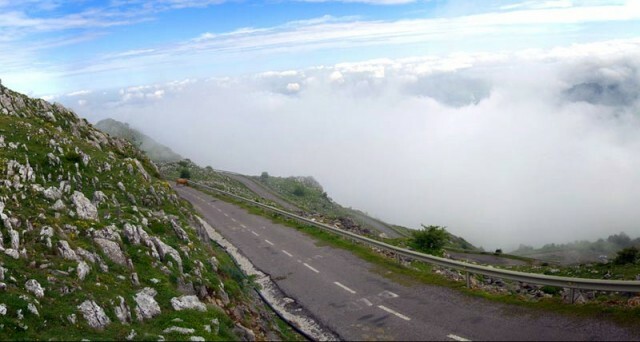 Again, there is the burning desire to go and ride up some proper European mountains.